While both start off with the same spice base, they yield very different flavors and textures. The quinoa stir-fry can be eaten both warm and cold while the crunchy bowl is best served warm. I bought most of my ingredients at Organic Touch in Belvedere Square which you can read more about here as I find their prices to be better than most other places. Plus, supporting local businesses is always good! The base for each dish is essentially everything pictured in the image below but you can change up the quantity or spice or add something else to it! Braise one finely chopped onion with 1 Tbsp coconut oil. For the crunchy bowl, I added spring onion as well and found that it gave the dish a lighter flavor. When the onions are browned, proceed to make either of the dishes below. Boil the quinoa as per package instructions until almost cooked. 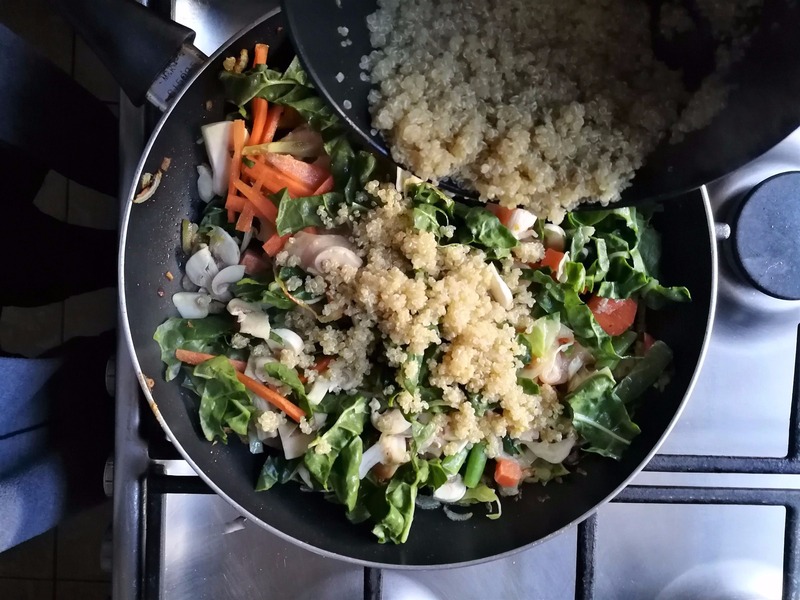 When the chicken is nearly done, add the soy-sauce and water, by this time, your quinoa should almost be thoroughly cooked through so take it off the heat and add it to the chicken and vegetable mixture. Allow everything to cook through add add more soy-sauce if you wish. I love using the range by Vital but any other brand will do. When the water evaporates, season with more salt and pepper and top with roughly chopped spinach. Thoroughly rinse a bag of these gluten-free, sugar-free and carbohydrate-free Shirataki Noodles (about R30) before preparing as per instructions. 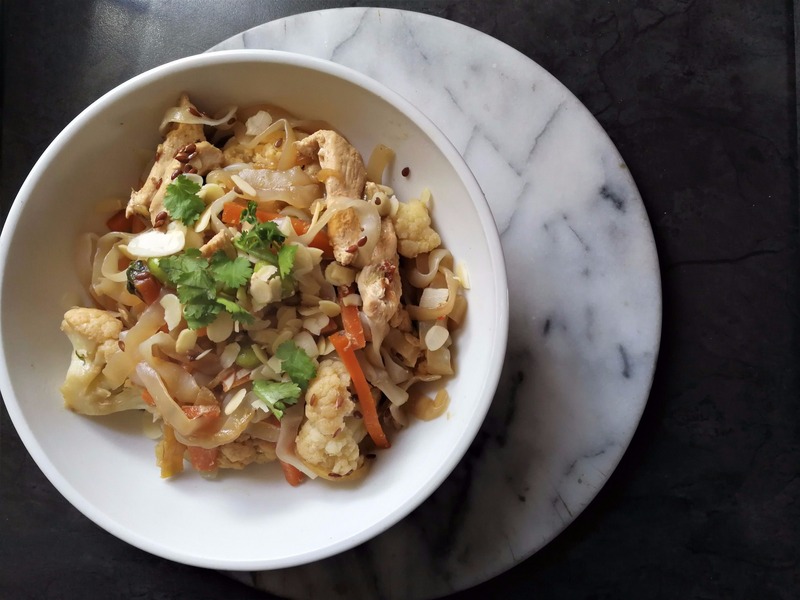 There are about 4 variants in these noodles and while either would work in this recipe, you have to make sure that you rinse them really well. Add the vegetables and water to the onion mix and let them cook for a bit. Place the noodles in a hot pan and dry fry for maximum 2 minutes and, when done, add them to the vegetable mix. You can do as I did above and add chicken or even prawns to this dish as it will make it go further and keep you satisfied for longer however, be sure to add it to the vegetable mix and allow it to cook finish before adding these noodles. Enjoy and be sure to let me know if you make them!